The energy efficiency of appliances has improved drastically over the last few decades. 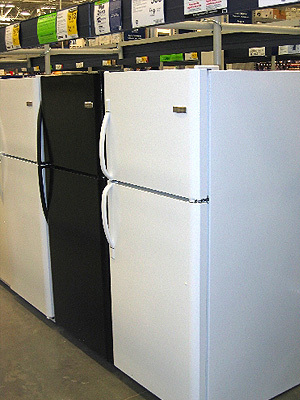 New refrigerators, for example, use one-half to one-quarter of the electricity older models consume. And the best dishwashers and clothes washer use less than half the water of older models. Look for the ENERGY STAR® label when shopping for appliances to identify the most efficient models. As a general rule, avoid frills like through-the-door ice and chilled water for a refrigerator, if you want the smallest environmental footprint and the highest energy efficiency.